We can not deny that decorating with rugs bring something cozy and helps define spaces. The type and material of which depends on the decorative style of the house, now a mixture of styles is imposed, as well as include some ethnic details. That is why kilim rugs have been gaining more and more support, for its strength, originality and warmth. These tapestries are from Central Asia, are based on an ancient weaving technique, born about 3500 years ago. Initially migrant tribes of this area used them to their stores and to insulate the floor, as they were almost impermeable. Over the years evolved kilims, and its use spread to room dividers, prayer rugs and tapestries. 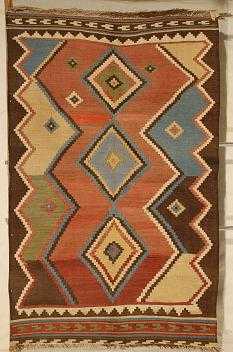 The kilim as known today is a fabric composed of wool yarns and weft (crosswise yarns) also wool or cotton. Its charm lies in the handmade by women of the nomadic tribes of Asia, Eastern Europe and North Africa. The colorful and geometric shapes are other characteristics of these rugs, usually the designs are unique and are based on the traditions and beliefs of the designs and the region that produces them. Such carpets are on precise purchases a vacation to an exotic destination. But if this is not your case, you can look into the network, since the supply of kilims is extensive. Handmade carpets, like the Kilim, have the advantage of providing a touch of originality to the rooms where they are placed. The proper place is not only the living room. As you can see in this picture, is the perfect touch to achieve a successful mixture of styles and discreetly in a bedroom.